One of our new years resolutions is to eat less meat. Everyone knows what a great meat lover I am and I do not see that changing (ever). However, I have been reading quite a bit about meat production lately and have realised that eating meat four days a week is just not cool. It's bad for the environment, the meat we buy from the supermarkets is pumped full of additives, medication and water and not to mention the way the poor animals are being treated. We have also noticed that most of the meat we get from the supermarkets just doesn't taste that great. So what's the point. So here comes the veggie challenge. My aim is to only cook two meat dishes a week and keep it strictly vegetarian for the rest of the week. This is a serious challenge for me. I find it incredibly hard to be creative with main courses, without using any meat at all (yep not even bacon or chorizo). I am also hoping that this challenge will reduce our weekly shopping bill, allow us to prepare lots of lovely dishes that are in season and live a little healthier. And for those days that we do have meat we will try and use suppliers such as the East London Steak Company and Able and Cole or the occasional Marks' purchase. While they are a tiny bit more expensive than your usual supermarkets they are definitely worth it. Have you got any other suggestions for good meat suppliers in London? Here's my first attempt at making a full veggie meal this year. 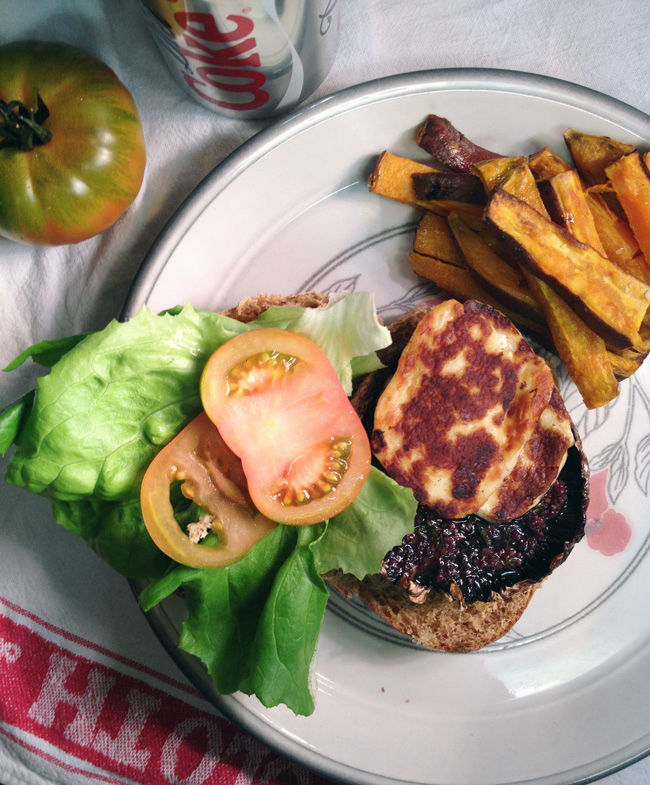 Portobello mushroom and halloumi burgers with sweet potato chips. The wine bit comes from this lovely recipe and definitely works wonders. Even the boys loved it. Mix the garlic, thyme, wine, mustard, Worcestershire sauce, olive oil and some salt and pepper in a bowl. 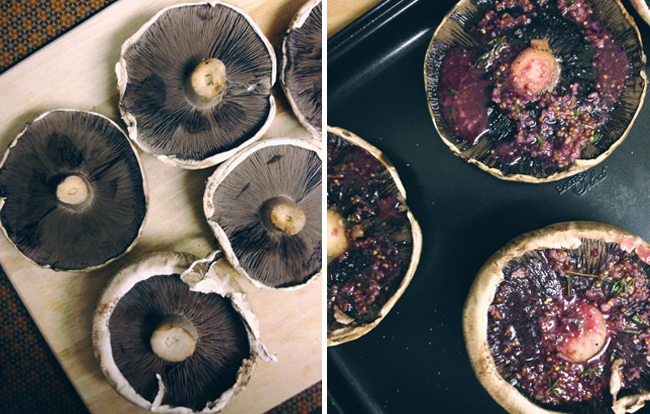 Place the mushrooms, top down, on a baking tray and drizzle with the wine/garlic mix. Place the sweet potato chips on another baking tray, drizzle with a little olive oil and season with plenty of salt and pepper. Make sure you only put a little olive oil on your chips to avoid sogginess. Put both trays in the oven and bake for 20-25 minutes until your chips are done. Flip the chips half way through. Once your your mushrooms and chips have been in the oven for about 10 minutes, heat a little olive oil in frying pan. Once hot fry your halloumi for a couple of minutes on each side until brown. Make sure the halloumi is still hot when serving as it goes rubbery when cold. 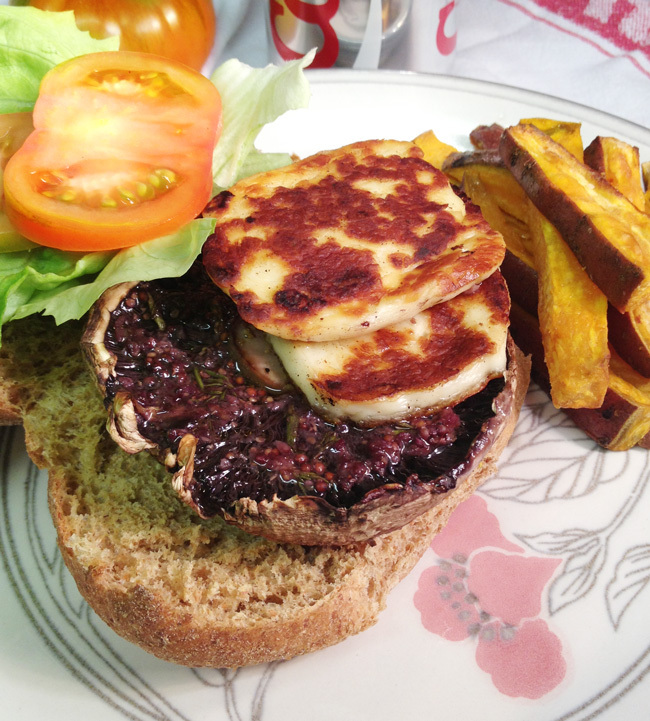 Place your mushroom on a toasted bun, top with the halloumi and veg of choice and add the tomato relish/ketchup/mayo... and enjoy!!! This is seriously yummy stuff and goes really well with an ice cold lager.